Scandi power metal has been with us, it seems, forever. If there is a triumvirate of masters lately its probably Stratovarius, Revolution Renaissance, and the subject of this review, Sonata Arctica. 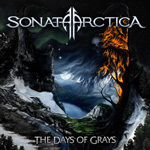 Days of Grays is their sixth studio album since 1999, and it displays Sonata Arctica at their best: epic and sweeping, melodic and symphonic, bombastic and grandiose. What other way is there to do power metal? Once again vocalist Tony Kakko and keyboardist Henrik Klingenberg have put their stamp of a more progressive tainted power metal on Days of Grays. Early Sonata Arctica were often too predictable with the typical galloping (and often punishing) power metal pace. This began to change on 2007's Unia. The arrangements Days of Grays are pleasantly diverse with clever compositional twists and vocal arrangements. A careful listen to the interesting The Dead Skin or The Truth Is Out There only proves this point. Still, Sonata Arctica's trademark solos of keyboard and guitar within sweeping arrangements remain on pieces like Deathaura and The Last Amazing Grays. Once again, on Days of Grays, Sonata Arctica proves their mastery of Scandi power metal. Better, they continue their evolution by inviting more innovative and progressive arrangements to their music. This alone raises them above their peers. Quite recommended. Once again, on Days of Grays, Sonata Arctica proves their mastery of Scandi power metal. Better, they continue their evolution by inviting more innovative and progressive arrangements to their music. This alone raises them above their peers.